Phnom Penh ( /pəˈnɔːmˈpɛn/ or /ˈnɒmˈpɛn/ ;   Khmer : ភ្នំពេញphnum pɨñ, Khmer pronunciation: [pʰnʊm ˈpɨɲ] ), formerly known as Krong Chaktomuk or Krong Chaktomuk Serimongkul (Khmer : ក្រុងចតុមុខសិរិមង្គល),  is the capital and most populous city in Cambodia. Phnom Penh has been the national capital since French colonization of Cambodia, and has grown to become the nation's economic, industrial, and cultural center. Once known as the "Pearl of Asia," it was considered one of the loveliest French-built cities in Indochina  in the 1920s. Phnom Penh, along with Siem Reap and Sihanoukville, are significant global and domestic tourist destinations for Cambodia. Founded in 1434, the city is noted for its historical architecture and attractions. There are a number of surviving French colonial buildings scattered along the grand boulevards. Siem Reap is the capital city of Siem Reap Province in northwestern Cambodia. It is a popular resort town and a gateway to the Angkor region. Sihanoukville, also known as "Kampong Som", is a coastal city in Cambodia and the capital] city of Sihanoukville Province, at the tip of an elevated peninsula in the country's south-west on the Gulf of Thailand. The city is flanked by an almost uninterrupted string of beaches along its entire coastline and coastal marshlands bordering the Ream National Park in the east. The city has one navigatable river, the mangrove lined Ou Trojak Jet running from Otres pagoda to the sea at Otres. A number of thinly inhabited islands – under Sihanoukville's administration – are near the city, where in recent years moderate development has helped to attract a sizable portion of Asia's individual travelers, young students and backpackers. A boulevard, often abbreviated Blvd, is a type of large road, usually running through a city. The Bassac River is a distributary of the Tonlé Sap and Mekong River. The river starts in Phnom Penh, Cambodia, and flows southerly, crossing the border into Vietnam near Châu Đốc. Phnom Penh from east drawn in 1887. Phnom Penh (literally, "Penh's Hill") takes its name from the present Wat Phnom ("Hill Temple"). Legend has it that in 1372, a wealthy widow named Lady Penh found a Koki tree floating down the Tonle Sap river after a storm. Inside the tree were four bronze Buddha statues and a stone statue of Vishnu. Daun Penh ordered villagers to raise the height of the hill northeast of her house and used the Koki wood to build a temple on the hill to house the four Buddha statues, and a shrine for the Vishnu image slightly lower down. The temple became known as Wat Phnom Daun Penh, which is now known as Wat Phnom, a small hill 27 metres (89 ft) in height. Wat Phnom is a Buddhist temple (wat) located in Phnom Penh, Cambodia. It was built in 1372, and stands 27 metres (88.5 ft) above the ground. It is the tallest religious structure in the city. The pagoda was given the name of Wat Preah Chedey Borapaut. Wat Phnom is the central point of Phnom Penh. This is the legendary story of the founding of Phnom Penh. 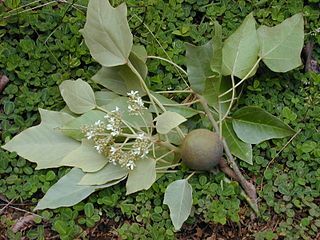 Aleurites moluccanus, the candlenut, is a flowering tree in the spurge family, Euphorbiaceae, also known as candleberry, Indian walnut, kemiri, varnish tree, nuez de la India, buah keras, or kukui nut tree, and Kekuna tree. Phnom Penh's official name, in its short form, is Krong Chaktomok (Khmer : ក្រុងចតុមុខ) meaning "City of Four Faces". Krong Chaktomuk is an abbreviation of the full name which was given by King Ponhea Yat, Krong Chaktomuk Mongkol Sakal Kampuchea Thipadei Serey Thereak Borvor Inthabot Borei Roth Reach Seima Maha Nokor (Khmer : ក្រុងចតុមុខមង្គលសកលកម្ពុជាធិបតី សិរីធរបវរ ឥន្ទបត្តបុរី រដ្ឋរាជសីមាមហានគរ, Khmer pronunciation: [ˌkɾongˌcaʔtoʔmʊk̚ˌmʊŋkʊlˌsaʔkɑlˌkampuʔciəˌtʰɨp̚paʔdəjˌseʔɾəjˌtʰe͡aʔɾe͡aʔˌbɑːvɑːˌənte͡aʔpatˌboʔɾəjˌɾoat̚tʰaʔˌɾiəcˌsəjmaːˌmɔhaːˌnɔˈkɔː] ). This loosely translates as "The place of four rivers that gives the happiness and success of Khmer Kingdom, the highest leader as well as unimpregnable city of the God Indra of the great kingdom". It is similar to the much more famous long name of Bangkok, which in both cases incorporates many words from Sanskrit. Ponhea Yat, also known as Barom Reachea II, was the last king of the Khmer Empire. He was a son of Khamkhat. Indra is a Vedic deity in Hinduism, a guardian deity in Buddhism, and the king of the highest heaven called Saudharmakalpa in Jainism. His mythologies and powers are similar to other Indo-European deities such as Jupiter, Perun, Perkūnas, Taranis, Zeus, and Thor. First recorded a century after it is said to have taken place, the legend of the founding of Phnom Penh tells of a local woman, Penh (commonly referred to as Daun Penh ("Grandmother Penh" or "Old Lady Penh") in Khmer), living at Chaktomuk, the future Phnom Penh. It was the late 14th century, and the Khmer capital was still at Angkor near Siem Reap 350 km (217 mi) to the north. Gathering firewood along the banks of the river, Lady Penh spied a floating koki tree in the river and fished it from the water. Inside the tree she found four Buddha statues and one of Vishnu. Penh, commonly referred to as Daun Penh, was a wealthy woman who is credited as having founded Phnom Penh, the capital of Cambodia, in 1372 AD. The discovery was taken as a divine blessing, and to some a sign that the Khmer capital was to be brought to Phnom Penh from Angkor. [ citation needed ] To house the new-found sacred objects, Penh raised a small hill on the west bank of the Tonle Sap River and crowned it with a shrine, now known as Wat Phnom at the north end of central Phnom Penh. "Phnom" is Khmer for "hill" and Penh's hill took on the name of the founder, and the area around it became known after the hill. Phnom Penh first became the capital of Cambodia after Ponhea Yat, king of the Khmer Empire, moved the capital from Angkor Thom after it was captured and destroyed by Siam a few years earlier. There is a stupa behind Wat Phnom that houses the remains of Ponhea Yat and the royal family as well as the remaining Buddhist statues from the Angkorean era. In the 17th century, Japanese immigrants also settled on the outskirts of present-day Phnom Penh. A small Portuguese community survived in Phnom Penh until the 17th century, undertaking commercial and religious activity in the country. Phnom Penh remained the royal capital for 73 years, from 1432 to 1505. It was abandoned for 360 years (from 1505 to 1865) by subsequent kings due to internal fighting between the royal pretenders. Later kings moved the capital several times and established their royal capitals at various locations in Tuol Basan (Srey Santhor), Pursat, Longvek, Lavear Em and Oudong. It was not until 1866, under the reign of King Norodom I (1860–1904), the eldest son of King Ang Duong, who ruled on behalf of Siam, that Phnom Penh became the permanent seat of government and capital of Cambodia, and also where the current Royal Palace was built. Beginning in 1870, the French colonial authorities turned a riverside village into a city where they built hotels, schools, prisons, barracks, banks, public works offices, telegraph offices, law courts, and health services buildings. In 1872, the first glimpse of a modern city took shape when the colonial administration employed the services of French contractor Le Faucheur to construct the first 300 concrete houses for sale and rental to Chinese traders. During the Vietnam War, Cambodia was used as a base by the North Vietnamese Army and the Viet Cong, and thousands of refugees from across the country flooded the city to escape the fighting between their own government troops, the NVA/NLF, the South Vietnamese and its allies, and the Khmer Rouge. By 1975, the population was 2–3 million, the bulk of whom were refugees from the fighting. The Khmer Rouge cut off supplies to the city for more than a year before it fell on April 17, 1975. Reports from journalists stated that the Khmer Rouge shelling "tortured the capital almost continuously," inflicting "random death and mutilation" on millions of trapped civilians. The Khmer Rouge forcibly evacuated the entire city after taking it, in what has been described as a death march: Francois Ponchaud wrote that "I shall never forget one cripple who had neither hands nor feet, writhing along the ground like a severed worm, or a weeping father carrying his ten-year old daughter wrapped in a sheet tied around his neck like a sling, or the man with his foot dangling at the end of a leg to which it was attached by nothing but skin";  John Swain recalled that the Khmer Rouge were "tipping out patients from the hospitals like garbage into the streets....In five years of war, this is the greatest caravan of human misery I have seen." All of its residents, including the wealthy and educated, were evacuated from the city and forced to do difficult labour on rural farms as "new people". Tuol Sleng High School was taken over by Pol Pot's forces and was turned into the S-21 prison camp, where people were detained and tortured. Pol Pot sought a return to an agrarian economy and therefore killed many people perceived as educated, "lazy" or political enemies. Many others starved to death as a result of failure of the agrarian society and the sale of Cambodia's rice to China in exchange for bullets and weaponry. The former high school is now the Tuol Sleng Genocide Museum, where Khmer Rouge torture devices and photos of their victims are displayed. Choeung Ek (The Killing Fields), 15 kilometers (9 mi) away, where the Khmer Rouge marched prisoners from Tuol Sleng to be murdered and buried in shallow pits, is also now a memorial to those who were killed by the regime. Phnom Penh is located in the south-central region of Cambodia, and is fully surrounded by the Kandal Province. 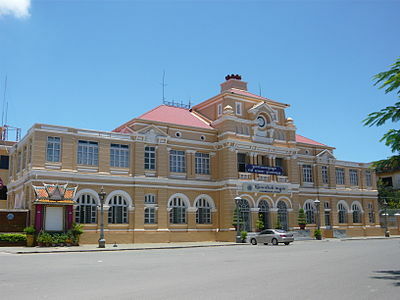 The municipality is situated on the banks of the Tonlé Sap, Mekong, and Bassac rivers. These rivers provide freshwater and other natural resources to the city. Phnom Penh and the surrounding areas consist of a typical flood plain area for Cambodia. Although Phnom Penh is situated at 11.89 metres (39 ft) above the river, monsoon season flooding is a problem, and the river sometimes overflows its banks. The city, located at 11°33′00″N104°55′00″E﻿ / ﻿11.55°N 104.91667°E﻿ / 11.55; 104.91667 (11°33' North, 104°55' East),  covers an area of 678.46 square kilometres (262 sq mi), with some 11,401 hectares (28,172 acres) in the municipality and 26,106 ha (64,509 acres) of roads. The agricultural land in the municipality amounts to 34.685 km2 (13 sq mi) with some 1.476 km2 (365 acres) under irrigation. Phnom Penh has a tropical wet and dry climate (Köppen climate classification Aw). The climate is hot year-round with only minor variations. Temperatures typically range from 22 to 35 °C (72 to 95 °F) and weather is subject to the tropical monsoons. The southwest monsoon blows inland bringing moisture-laden winds from the Gulf of Thailand and Indian Ocean from May to November. The northeast monsoon ushers in the dry season, which lasts from December to April. The city experiences the heaviest precipitation from September to October with the driest period in January and February. The city has two distinct seasons. The rainy season, which runs from May to November, sees high temperatures accompanied by high humidity. The dry season lasts from December to April; when overnight temperatures can drop to 22 °C (72 °F). Phnom Penh is a municipality of area 678.46 square kilometres (261.95 sq mi) with a government status equal to that of Cambodian provinces. The municipality is subdivided into twelve administrative divisions called khans (sections) and of these twelve Khans, Dangkao, Meanchey, Porsenchey, Sen Sok and Russei Keo are considered the outskirts of the city. All Khans are under the governance of the Phnom Penh Municipality. The sections are further subdivided into 76 sangkats (quarters), and further subdivided into 637 phums (villages). Phnom Penh is mostly inhabited by Cambodians (or Khmers) – they represent 90% of the population of the city. There are large minorities of Chinese, Vietnamese, and other small ethnic groups who are Thai, Budong, Mnong Preh, Kuy, Chong, and Chams. The state religion is Theravada Buddhism. More than 90% of the people in Phnom Penh are Buddhists. Chams have been practicing Islam for hundreds of years. Since 1993, there has also been an increase in the practice of Christianity which was practically wiped out after 1975 when the Khmer Rouge took over. The official language is Khmer, but English and French are widely used in the city. Note: As stated in the "History" paragraph (The 1998 Census put Phnom Penh's population at 862,000;  and the 2008 census was 1.3 million.  ) the information collides with the information provided in the "Historical population" table. Needs editing. Phnom Penh is allocated 12 seats in the National Assembly, making it the largest constituency. Phnom Penh is Cambodia's economic centre as it accounts for a large portion of the Cambodian economy. Double-digit economic growth rates in recent years have triggered an economic boom in Phnom Penh, with new hotels, restaurants, bars, high rises and residential buildings springing up around the city. With booming economic growth seen since the 1990s, new shopping retails have opened as well as western-style such as Sorya Center Point, Aeon Mall Phnompenh, Aeon mall sen sok city, Olympia Mall and Parkson Mall(Under construction ). Many international brands had opened such as Mango, Salvatore Ferragamo, Hugo Boss, Padini Concept Store, Lily, Timberland, Jimmy Choo, CC Double O, MO, Brands Outlet, Nike, Converse, Pony, Armani Exchange, Super Dry and so on. Phnom Penh is coming a central of many international financial banks and shopping centers in the middle of South-east Asia lately. The tallest skyscraper in Phnom Penh is Vattanac Capital Tower  at a height of 188 metres (617 ft), dominating Phnom Penh's skyline with its neighbour skyscraper Canadia Tower (OCIC Tower). The tower was topped out in May 2012 and scheduled for completion in late 2012. Modern high rises have been constructed all around the city, not concentrated in any one particular area. The Central market Phsar Thmei is a tourist attraction. The four wings of the yellow colored market are teeming with numerous stalls selling gold and silver jewellery, antique coins, clothing, clocks, flowers, food, fabrics and shoes. Phsar Thmei is undergoing under a major renovation, along with the creation of newer stalls. Statue of Lady Penh, the city's founder. Phnom Penh also has its own dialect of Khmer. Speakers of the Phnom Penh dialect often elide syllables, which has earned it the reputation for being lazy speech. Phnom Penh is also known for its influence on New Khmer Architecture. Phnom Penh is notable for Ka tieu Phnom Penh, its variation on rice-noodle soup, a dish available in sit-down cafes as well as 'street' cafes. The city is both the economic and cultural center of Cambodia. Music and the arts are making a revival throughout Cambodia, especially in Phnom Penh. Phnom Penh currently hosts a number of music events throughout the city. 'Indie' bands (those without corporate sponsors) have grown in number due also in part to the emergence of private music schools such as SoundsKool Music (also operating in the city of Siem Reap), and Music Arts School (registered as an NGO). 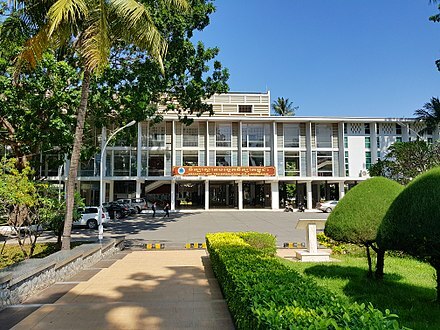 The two most visited museums in the city are the National Museum, which is the country's leading historical and archaeological museum, and Tuol Sleng Genocide Museum, a former Khmer Rouge prison. At this time, Phnom Penh celebrates Cambodian New Year, an occasion increasingly popular with tourists. During this typically hottest part of the year, water gets thrown around adding to the party atmosphere along with dancing and music. The precise date changes year-by-year but this holiday lasts, at least, three days. This festival marks the turn of the year based on the ancient Khmer calendar and also marks the end of the prior year harvest. The largest annual festival in Phnom Penh, this lively gathering celebrates the reversing of the flow of the Tonlé Sap river. The holiday lasts three days as people flood into the city to enjoy the fireworks, colourful boat races, live concerts, eating and partying. The boat racing dates back to ancient times marking the strengths of the Khmer marine forces during the Khmer Empire. Pchum Ben is a very important aspect of Cambodian culture. It may be translated as "gathering together" to make offerings and is a time of reunion, commemoration, express love and appreciation for one's ancestors. By offering food and good karma to those possibly trapped in the spirit world, living relatives help assuage their misery and guide them back into the cycle of reincarnation. Vesākha is an annual holiday observed traditionally by Buddhists in Cambodia. Sometimes informally called "Buddha's Birthday", it actually encompasses the birth, enlightenment (nirvāṇa), and passing away (Parinirvāna) of Gautama Buddha. Statue of Decho Yod and Decho Meas in Phnom Penh. The oldest structure is Wat Phnom from the founding days of the city, constructed in 1373. The main tourist attractions are the Royal Palace with the Silver Pagoda, and the National Museum, constructed during the French colonial era in the late 19th century in the classical Khmer style and hosting a vast collection of Khmer antiquities. The Independence Monument (Khmer: Vimean Akareach), although from the 1950s, is also constructed in the ancient Khmer style. The French, who were the colonial masters from the 19th century to the 1940s, also left their mark, with various colonial villas, French churches, boulevards, and the Art Deco market Phsar Thom Thmei. A notable landmark of the colonial era is the Hotel Le Royal. Starting with independence from the French in the 1950s and lasting until the era of the Khmer Rouge in the 1970s, Phnom Penh underwent tremendous growth as the capital city of a newly independent country. King Sihanouk was eager to present a new style of architecture and thus invigorate the process of nation building. A new golden era of architecture took off, with various projects and young Khmer architects, often educated in France, given opportunities to design and construct. This new movement was called "New Khmer Architecture" and was often characterised by a fusion of Bauhaus, European post-modern architecture, and traditional elements from Angkor. The most prominent architect was Vann Molyvann, who was nominated chief national architect by the King himself in 1956. Molyvann created landmark buildings such as the Preah Suramarit National Theatre and the Council of Ministers building. 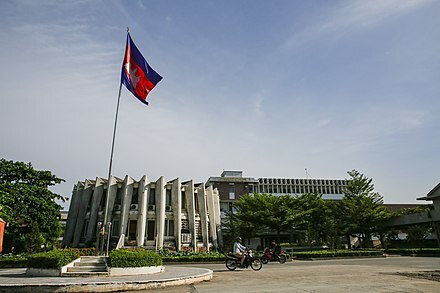 Other architects helped construct the newly founded Royal Khmer University, the Institute of Foreign Languages and the National Sports Centre. With the growth of the upper and entrepreneurial middle classes, new suburbs were built in the 1950s and 60s. Although these buildings survived the Khmer Rouge era and the civil war, today they are under threat due to economic development and financial speculation. [ citation needed ] Villas and gardens from that era are being destroyed and redeveloped to make place for bigger structures. The landmark National Theatre by Molyvann was ripped down in 2008. A movement is rising in Cambodia to preserve this modernist heritage. Old villas are sometimes being converted into boutique hotels, such as the Knai Bang Chatt. Monuments and memorials to the genocide during the Khmer Rouge era in the 1970s are the Tuol Sleng Genocide Museum (a former high school used as a concentration camp) and, on the outskirts of the city, the Choeung Ek Genocide Center. The Cambodia-Vietnam Friendship Monument was commissioned by the Vietnamese communists as symbol of Khmer-Vietnamese friendship during the late 1970s following the liberation of Cambodia from the Khmer Rouge. The population, foreign investment, and urban development in Phnom Penh grew dramatically during the 1990s and early 2000s. The rapid growth resulted in the city's infrastructure distinctly lacking (the drainage system is particularly notorious, and Phnom Penh frequently floods during the wet season), and a need for both residential and commercial spaces. The simultaneous demand for residential and commercial housing and the increase of international investment has led to the planning, if not construction, of several satellite cities. The largest of these cities are: Grand Phnom Penh International City, CamKo City, Diamond Island City, Boeung Kak Town, and Chruy Cangva City. On the outskirts of the city, farmland has been developed into garment factories and housing for lower economic classes and those displaced by the new development in the city center. View of the National Museum , designed in the early 1920s by George Groslier. View of the Royal Throne Hall , constructed in the 1860s under King Norodom I. Façade of the Hotel Le Royal , first established in 1929 under the reign of King Sisowath Monivong. View of a Colonial villa in Phnom Penh. Moneaksekar Khmer (Khmer Conscience) – Published by the Sam Rainsy Party. Rasmei Kampuchea (Light of Kampuchea) – Cambodia's largest daily, it circulates about 18,000 copies. Phnom Penh Post , a daily English-language newspaper published in Phnom Penh. The Cambodia Daily , an English-language daily newspaper (closed in 2017). The Khmer Times , an English-language daily newspaper. 《柬華日報》(Jianhua Daily), a daily Chinese-language newspaper published in Phnom Penh. 《星洲日報》( Sin Chew Daily ), a Chinese-language daily newspaper, the Cambodian edition of the Malaysian Chinese daily of the same name. 《華商日報》(Huashang Daily), a Chinese-language daily newspaper. 《高棉日报》(Khmer Daily), a Chinese-language daily newspaper. 《新柬埔寨》(New Cambodia), a Chinese-language daily newspaper. AsiaLIFE Guide Phnom Penh, a monthly English-language lifestyle magazine published in Phnom Penh. Pocket Guide Cambodia publishes four separate guides aimed at English-speaking residents and visitors. F Magazine , the first fashion-forward magazine in Cambodia. Bi-lingual, written in English and Khmer. SOVRIN Magazine , is the premium fashion magazine in Cambodia which written in khmer language. Thmey Thmey Online News Phnom Penh. The most prominent sporting venue in the city is the Phnom Penh National Olympic Stadium with a capacity of 80,000  —although the country never hosted the Olympic Games due to disruption by the civil war and the Khmer Rouge in the 1970s. Built in 1964,  it is home to the Cambodian national football team. On completion the stadium was one of the largest in Asia. Today it is the 6th largest stadium in Southeast Asia. Volleyball, basketball, and Tai-Kwon-Do games are often hosted at the stadium. The stadium closed in 2000,  but was redeveloped and reopened. The National Sports Centre of Cambodia hosts swimming, boxing, and volleyball competitions. Noted local football clubs include Phnom Penh Empire, Khemara Keila FC and Military Police. Phnom Penh International Airport is the largest and busiest airport in Cambodia. It is located 7 kilometres (4.3 mi) west of central Phnom Penh. Cambodia's national flag carrier, Cambodia Angkor Air, launched in 2009, is headquartered in Phnom Penh and has its main hub there, with an additional hub at the Angkor International Airport. Budget flights from Bangkok and Kuala Lumpur to Phnom Penh are operated by AirAsia, a regional low-cost carrier. Other budget carriers include Jetstar Asia Airways with daily flights to Singapore. Air France used to serve Phnom Penh from Paris-Charles de Gaulle but this service has since stopped. Qatar Airways now flies to and from Phnom Penh, via Ho Chi Minh. Taxis, pick-ups, and minibuses leave the city for destinations all over the country, but are fast losing ground to cheaper and more comfortable buses. Phnom Penh also has a rail service. There are numerous bus companies, including Phnom Penh Public Transport and GST Express, running services to most provincial capitals, including Sihanoukville, Kampong Chhnang, Oudong and Takéo. Phnom Penh Sorya Transport Co. offers bus service to several provincial destinations along the National Routes and to Ho Chi Minh City. Giant Ibis is another bus company based in Phnom Penh, which travels to Sihanoukville, Kampot, Siem Reap and Ho Chi Minh, and has free wifi, air conditioning and modest pricing. Although the city is 290 kilometres (180 mi) from the sea, it is home to Cambodia's main freshwater port, a major port on the Mekong River, and it is linked to the South China Sea via a channel of the Mekong delta in Vietnam. Phnom Penh is served by three air conditioned bus lines. Initial attempts by the Japanese government to develop a Phnom Penh bus service began in 2001. An update of the JICA urban transport master plan for Phnom Penh was completed and implemented in 2014. The city is now served by three bus lines, operated by the Phnom Penh municipal government. Private transportation within the city include the cycle rickshaw, known in Khmer as "cyclo", the motorcycle taxi known in Khmer as "moto", the auto rickshaw known locally as "tuk-tuk", the trailer attached to a motorcycle taxi known in Khmer as "remorque", and the standard automobile taxicab known in Khmer as "taxi". 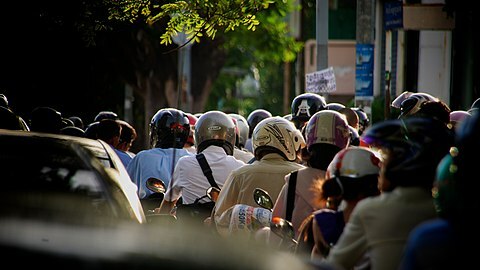 Private forms of transportation used by locals include bicycles, motorbikes and cars. Water supply in Phnom Penh has improved dramatically in terms of access, service quality, efficiency, cost recovery and governance between 1993 and 2006. The number of customers has increased ninefold, service quality has improved from intermittent to continuous supply, water losses have been cut dramatically and the city's water utility went from being bankrupt to making a modest profit. These achievements were recognized through international awards such as the 2006 Ramon Magsaysay Award and the 2010 Stockholm Industry Water Award. The city's water utility is the Phnom Penh Water Supply Authority (PPWSA). Its main water sources are the Mekong River, the Tonle Sap river and the Tonle Bassac river. The Tuol Sleng Genocide Museum is a museum in Phnom Penh, the capital of Cambodia, chronicling the Cambodian genocide. The site is a former secondary school which was used as Security Prison 21 (S-21) by the Khmer Rouge regime from its rise to power in 1975 to its fall in 1979. From 1976 to 1979, an estimated 20,000 people were imprisoned at Tuol Sleng. Tuol Sleng means "Hill of the Poisonous Trees" or "Strychnine Hill". Tuol Sleng was just one of at least 150 torture and execution centers established by the Khmer Rouge, though other sources put the figure at 196 prison centers. On July 26, 2010, the Extraordinary Chambers in the Courts of Cambodia convicted the chief of Tuol Sleng Prison, Kang Kek Iew, for crimes against humanity and grave breaches of the 1949 Geneva Conventions and sentenced him to life imprisonment. Kang Kek Iew or Kaing Kek Iev, also romanized as Kaing Guek Eav, nom de guerre Comrade Duch or Deuch (មិត្តឌុច); or Hang Pin, is a prisoner, war criminal and former leader in the Khmer Rouge movement, which ruled Democratic Kampuchea from 1975 to 1979. As the head of the government's internal security branch (Santebal), he oversaw the Tuol Sleng (S-21) prison camp where thousands were held for interrogation and torture, after which the vast majority of these prisoners were eventually executed. Battambang is a province (khaet) of Cambodia located in the far northwest. Bordering provinces are Banteay Meanchey to the north, Pursat to the east and south, Siem Reap to the northeast, and Pailin to the west. The northern and southern extremes of the province's western boundaries form part of the international border with Thailand. In addition, Tonle Sap forms part of the northeastern boundary between Siem Reap and Pursat. Its capital and largest city is Battambang. Kampong Thom is a province (khaet) of Cambodia. It borders the provinces of Siem Reap to the northwest, Preah Vihear to the north, Stung Treng to the northeast, Kratie to the east, Kampong Cham, Kampong Chhnang to the south, and the Tonle Sap to the west. The Royal Palace, in Phnom Penh, Cambodia, is a complex of buildings which serves as the royal residence of the king of Cambodia. Its full name in the Khmer language is Preah Barum Reachea Veang Chaktomuk Serei Mongkol. The Kings of Cambodia have occupied it since it was built in the 1860s, with a period of absence when the country came into turmoil during and after the reign of the Khmer Rouge. The Santebal, a Khmer term meaning "keeper of the peace", was the Special Branch of the Khmer Rouge regime in Cambodia. The state of Kampuchea, officially Democratic Kampuchea, refers to Cambodia under one-party Marxist-Leninist communist rule that existed between 1975 and 1979. The state was controlled by the Khmer Rouge (KR), the name popularly given to the followers of the Communist Party of Kampuchea (CPK) and was founded when KR forces defeated the Khmer Republic of Lon Nol in 1975. 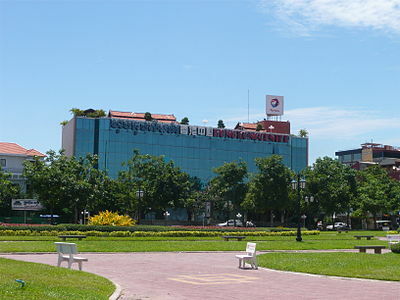 The Royal University of Phnom Penh (RUPP) is a national university of Cambodia, located in the capital Phnom Penh. Established in 1960, it is the country's largest university. It hosts more around 20,000 students in undergraduate and postgraduate programs. It offers degrees in fields such as sciences, humanities and social sciences, engineering as well as vocational courses in fields such as information technology, electronics, psychology and tourism. RUPP provides Cambodia’s foremost degree-level language programs through the Institute of Foreign Languages. RUPP has full membership in the ASEAN University Network (AUN). Chamkar Mon District is the southernmost district in central Phnom Penh, Cambodia.. The district has an area of 10.56 km². According to the 2008 census of Cambodia, it had a population of 182,004. Bakan District is a district in Pursat Province, Cambodia. The district capital is at Trapeang Chong located on National Highway 5 around 15 kilometres north of the provincial capital at Pursat town. 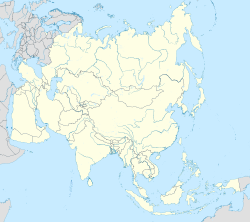 Kandieng District is a district in Pursat Province, Cambodia. The district capital is at Kandieng town located about 12 km from the Provincial capital Pursat. Chaktomuk Conference Hall was designed by Vann Molyvann and completed in 1961, when it hosted the Sixth Conference of the World Fellowship of Buddhists. The 570-seat auditorium's structure was inspired by an unfolded hand-held fan as Chaktomuk Hall flares out like a hand-held fan. The hall, on the banks of the Tonlé Sap river in Phnom Penh, is still in use as a performance space. Previously known as La Salle de Conférence Chaktomuk, it was earmarked for redevelopment as a restaurant in 1991. However, it was brought back into use as a theatre in 1994 following the devastating fire at the National Theatre. In 2000, the Chaktomouk Conference Hall was completely refurbished, mainly to provide international-standard facilities for conferences. The hall is still in use as a performance space. The hall was completely abandoned during the Khmer Rouge regime. In 1979, the People's Republic of Kampuchea tried the former Khmer Rouge leaders in absentia in the hall. Today it is used to accommodate hundreds of people on occasions such as government conferences and cultural events organized by the Ministry of Culture and Fine Arts. Mam Nai or Mam Nay, nom de guerre Comrade Chan (សមមិត្តច័ន្ទ), is a war criminal and former lieutenant of Santebal, the internal security branch of the Khmer Rouge communist movement, which ruled Democratic Kampuchea from 1975 to 1979. He was the leader of the interrogation unit at Tuol Sleng (S-21), assisting Kang Kek Iew, the head of the camp where thousands were held for interrogation, torture and subsequent killing. ↑ "SO 3166 — Codes for the representation of names of countries and their subdivisions: Cambodia KH". ISO. Retrieved 28 October 2018. 1 2 "Facts Phnom Penh City". Phnompenh.gov.kh. Retrieved 29 June 2016. ↑ "Sub-national HDI – Area Database – Global Data Lab". hdi.globaldatalab.org. Retrieved 2018-09-13. ↑ Peace of Angkor Phnom Penh Archived April 16, 2007, at the Wayback Machine . Retrieved July 27, 2007. ↑ NIS (August 2009). General Population Census of Cambodia 2008. National Institute of Statistics, Ministry of Planning. p. 23. 1 2 "Phnom Penh and around Guide – Cambodia Travel". Rough Guides. ↑ Sopheak wordpress, . Retrieved August 23, 2009. ↑ Japan Times Online Researcher locates 17th-century Japanese village in Cambodia. Retrieved January 20, 2009. ↑ K-media, . Retrieved August 23, 2009. ↑ Stuart-Fox, William, The Murderous Revolution: Life & Death in Pol Pot's Kampuchea, Alternative Publishing Co-Operative Limited, 1985, pp. 17. ↑ Barron, John and Anthony Paul (1977), Murder of a Gentle Land, Reader's Digest Press, pp. 1–2. ↑ Ponchaud, Francois (1978), Cambodia Year Zero, Holt, Rinehart and Winston, pp. 6–7. ↑ Swain, John (1999), River of Time: A Memoir of Vietnam and Cambodia, Berkley Trade. ↑ "GNS: Country Files". Earth-info.nga.mil. Archived from the original on August 12, 2005. Retrieved June 27, 2010. ↑ "Klimatafel von Phnom Penh / Kambodscha" (PDF). Baseline climate means (1961–1990) from stations all over the world (in German). Deutscher Wetterdienst. Retrieved January 23, 2016. ↑ Cappelen, John; Jensen, Jens. 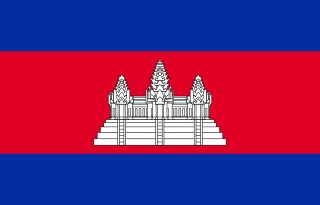 "Cambodia – Phnom Penh" (PDF). Climate Data for Selected Stations (1931–1960) (in Danish). Danish Meteorological Institute. p. 44. Archived from the original (PDF) on April 27, 2013. Retrieved March 9, 2013. ↑ "Phnom Penh's burgeoning population could tip almost 3 million". The Phnom Penh Post . 18 August 2016. Retrieved 25 August 2016. ↑ Phnom Penh's slums swell in 2012. Retrieved 2013-07-25. ↑ People's Daily Online Cambodia unveils Phnom Penh development plan. Retrieved June 14, 2008. ↑ "De Castle". De Castle. Retrieved June 27, 2010. ↑ "Vattanac Capital". Riverpalace.net. Archived from the original on November 15, 2011. Retrieved June 27, 2010. ↑ "アジアの補習授業校一覧（平成25年4月15日現在）" (). Ministry of Education, Culture, Sports, Science and Technology. Retrieved on February 13, 2015. "プノンペン Phnom Penh Japanese School No,3EO St.390 PhnomPenh Cambodia"
↑ "Home." Japanese Association of Cambodia (JACAM;カンボジア日本人会). Retrieved on March 31, 2015. ↑ Se, Suy (November 23, 2010). "Cambodia festival stampede leaves almost 350 dead". The Age. Melbourne. ↑ "Khmer Architecture Tours". Ka-tours.org. May 30, 2010. Retrieved June 27, 2010. ↑ "Phnom Penh master plan extended to 2035 | CBDA". www.cbda.org.kh. Retrieved 2016-12-12. ↑ Paling, Willem (2012). "Planning a Future for Phnom Penh: Mega Projects, Aid Dependence and Disjointed Governance". Urban Studies. 49: 2889–2912. doi:10.1177/0042098012452457. 1 2 3 ppp_webadmin (April 27, 2001). "Stadium dream becomes public nightmare". phnompenhpost.com. ↑ "Cambodian Fans Deflated After World Cup Loss – The Cambodia Daily". cambodiadaily.com. June 12, 2015. ↑ "Welcome". Cambodia Angkor Air. 2009. Retrieved December 28, 2009. ↑ "Sister Cities". Phnompenh.gov.kh. Archived from the original on August 23, 2013. Retrieved October 31, 2012. ↑ "Sistercities of city of Kitakyushu". City of Kitakyushu. Groslier, B.P. (2006). Angkor And Cambodia In the Sixteenth Century. Bangkok: Orchid Press. Igout, Michel; Dubuisson, Serge (1993). Phnom Penh Then and Now. Bangkok: White Lotus. ISBN 978-974-8495-84-2. OCLC 29795478. LeBoutillier, Kris; Ariff, Shahida (2004). Journey Through Phnom Penh: A Pictorial Guide to the Jewel of Cambodia. Singapore: Times Editions. ISBN 978-981-232-596-9. OCLC 55501046. Leroy, Joakim; Hoskin, John (2005). AZU's Dreams of Cambodia. Phnom Penh. Hong Kong: AZU Editions Ltd. ISBN 978-988-98140-2-1. OCLC 62328690. In Robert Ludlum's Jason Bourne novel series, David Webb is a young officer posted in Phnom Penh with his wife and his two children.